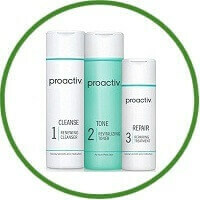 Proactiv is one of the most popular acne treatments available in the market today. It is highly recommended for all. It includes cleanser, toner and treatment. One of the most popular acne treatments to ever hit the market, Proactiv is a worldwide product marketed by the idea that it was developed by 2 dermatologists. Others using their main ingredient, benzyl peroxide have been developed before and since, but none have quite measured up to its marketing. Proactiv is on the right track in recommending benzyl peroxide, and specifically recommending it in 2.5% strength. The Proactiv Cleanser contains scrubbing beads, and Proactiv recommends washing for 1-2 minutes with this cleanser. I am quite stunned at both of these oversights. It is absolutely vital to avoid irritation when treating acne, especially inflammatory acne—the kind most of us have. Scrubbing beads, and washing for this amount of time introduces unnecessary and damaging irritation, perpetuating the acne cycle. I think the Proactiv toner is fine, albeit unnecessary to achieve clear skin. Over 20+ years of benzyl peroxide research and experience, we have found that for benzyl peroxide to completely clear acne, people must apply it generously. Next, Proactiv combines their benzyl peroxide treatment with moisturizer. One of the main reasons benzyl peroxide works so well is because it is a drying and peeling agent, which helps prevent clogged pores. For this reason, it is a good idea to apply benzyl peroxide without moisturizer, and let the benzyl peroxide do its thing for a few minutes (5-15) before introducing moisture. Unfortunately, you don’t have that choice with the Proactiv treatment. Those who enjoy using Proactiv products may enjoy using the Proactiv Dark Spot Corrector, but people should really consider all of their options for dealing with facial spots. 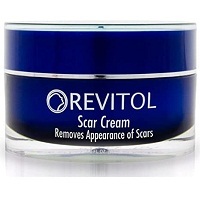 It contains a lot of chemicals that people may not want on their face, and it is expensive for those who don’t want to buy the rest of the Proactive system. 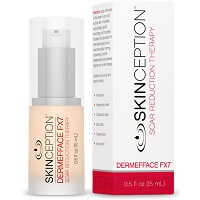 There are tons of other options that may be more effective at evening out skin tone, although this does offer some results.